“You can create portfolios of art, buy and sell shares of Picassos in our marketplace, and even buy an authorized replica to show all your friends,” says co-founder Victor Costa. Does the name Pablo Picasso ring a bell? How about Leonardo da Vinci or Claude Monet? Chances are, most people have heard of these painters but only a select group of people actually own their masterpieces. Joining this group has a hefty price tag. Last February, Pablo Picasso’s Femme au béret et à la robe quadrille (1937) sold at auction for over $69 million. ARTOPOLIE acquires each masterpiece and files it with the Securities and Exchange Commission (SEC). Once the SEC approves the offering, ARTOPOLIE will sell fractional ownership on its platform. Investors can buy shares for as little as $50. They’ll own a fraction of a Picasso, much like buying stock in Jeff Bezos’ Amazon.com, Inc. (NASDAQ: AMZN). Investors who put money into art at the beginning of 2018 saw an average gain of 10.6% by the end of November, according to Art Market Research’s Art 100 Index, the closest thing the industry has to a benchmark. During the same period, investors who put money into the S&P 500 lost 5.1%, based on estimates of total return. The difference? It’s fairly easy to invest in the S&P 500 but those who were lucky, and rich, enough to invest in art most likely bought at auction or at an art gallery. 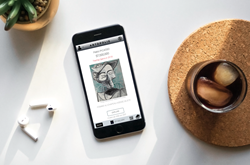 ARTOPOLIE, the world’s FIRST APP-BASED ART INVESTOR PLATFORM, will allow investors to diversify their investments in fine art, a $64 billion market currently untapped by the average person. “The ~$64 billion we see trading each year in the art industry is less than the daily volume that is trading in the Forex market, stock market, or real estate market. ARTOPOLIE will give access to a flood of new investors. It is very possible that our platform will take the art industry well over $100 billion per year,” says co-founder Bruno Costa. When art is purchased, either at auction or privately through an art gallery, the buyer typically stores it in his home or securely in a vault, only for the buyer to see. “The issue we see today is that a lot of art has been hidden from public viewing, tucked away by its buyers. Art should be appreciated by everyone, not by just a select few. This is why the art you see on our platform will always be hanging at a museum or at our own gallery, easily accessible and appreciated by everyone,” says Bruno Costa. The platform will allow investors to vote on which museum the art will appear. For those investors who want to hang the art in their homes, ARTOPOLIE has developed a solution. “You can create portfolios of art, buy and sell shares of Picassos in our marketplace, and even buy an authorized replica to show all your friends,” says co-founder Victor Costa. The ARTOPOLIE shop will be open only to investors and will sell replicas, limited apparel, and branded gear from ARTOPOLIE partners. The New York Metropolitan Museum of Art, the Met, receives visits from more than 6.3 million people each year, according to a 2015 study. Museum admission is $25 if you are not a New York, New Jersey, or Connecticut resident. Soon, those visiting a museum will get much more than they bargained for. ARTOPOLIE plans to allow users to buy shares directly at a museum, merely by scanning the artwork through the platform on their phones. The platform is set to officially launch in Miami at Art Basel 2019. ARTOPOLIE’s investors and backers include professional basketball players, professional soccer players, Silicon Valley CEOs, and prominent art collectors and dealers. Most recently, Oscar Emboaba, a Brazilian professional footballer who plays as an attacking midfielder for Chinese club Shanghai SIPG and for Brazil’s national team, has joined ARTOPOLIE. Oscar made headlines in 2017 when he signed a $100 million+ transfer from Chelsea F.C. to Shanghai SIPG F.C., which made him one of the world's highest-paid players.